I was invited to participate in a portfolio exchange for the 2012 Southern Graphics Council Conference in New Orleans. Yoonmi Nam was the organizer for this exchange and the following folks are participating: Kristi Arnold, Laura Berman, Teresa Cole, Christa Dalien, Kristina Estell, Adriane Herman, Mary Anne Jordan, Mari LaCure, Serena Perrone, and Nicolette Ross. "In The Background exchange portfolio will be a tribute to our decorative and commercial printmaking history. The styles, patterns and the subject matters depicted in each print reveal how we locate ourselves geographically, socially, culturally, and historically: where we live, where we came from, and where we want to go. Often in the background, the use of wallpaper throughout history has been of an ephemeral nature. Whether it was used to transport ourselves to a picturesque French landscape in our own living rooms or to cover and conceal what lies underneath, wallpaper has the ability to create a mood and atmosphere. As styles changed over time, so did the coverings on our walls. Artists will make their own wallpaper designs based on their diverse interests and backgrounds while addressing the culture of this man-made environment and the potential transformation of an interior space. Using both conventional and unconventional subject matters, each print will be a sample wallpaper section with the potential to expand to become a continuous pattern. The completed portfolio could resemble a high-end wallpaper sample book providing a sense of potential to be used as wallpapers, and at the same time, each print will be able to stand alone as an image." For those of you who are not aware of the tradition of exchange portfolios, in addition to a theme, there are rules regarding paper size, image size, orientation, etc. The rules for our particular exchange included: The print can be any print medium, printed on any 2-dimensional surface that measures 20 x 27 inches. 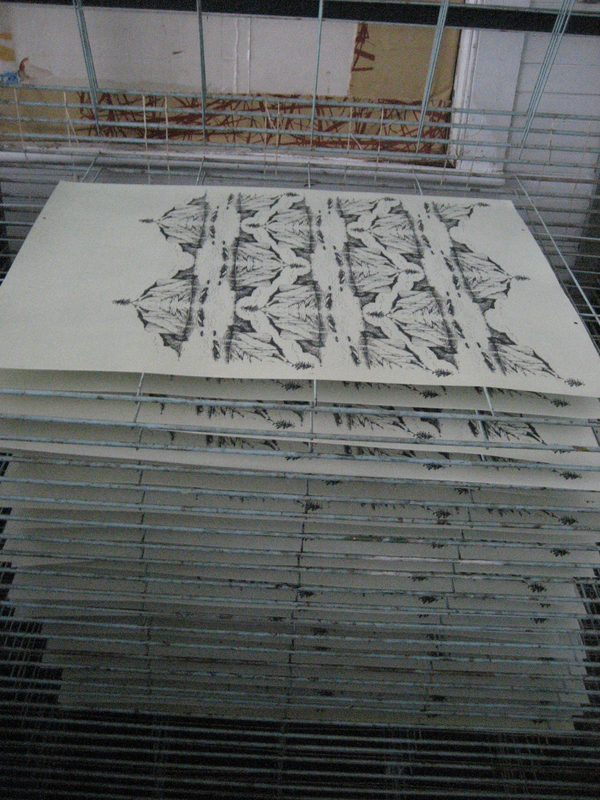 The print must have a bleed image with razor cut edges, however the pattern could be horizontal or vertical. The edition size is 14. The final prints will be bound into a large wallpaper sample book. 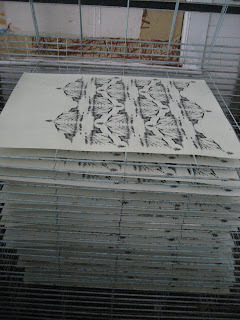 I am currently working at Wells Book Arts Center have been surrounded by amazing letterpress cuts. While I am drawn to these cuts for their aesthetic and nostalgia, I think that it is interesting that they are essentially old-fashion clip art. I wondered if I would be able to transform the cuts into a larger wallpaper piece, using this "clipart" as an essential element in the design. I began by printing many, many images and was drawn to a print I made that mirrored the image of one of the landscape cuts. 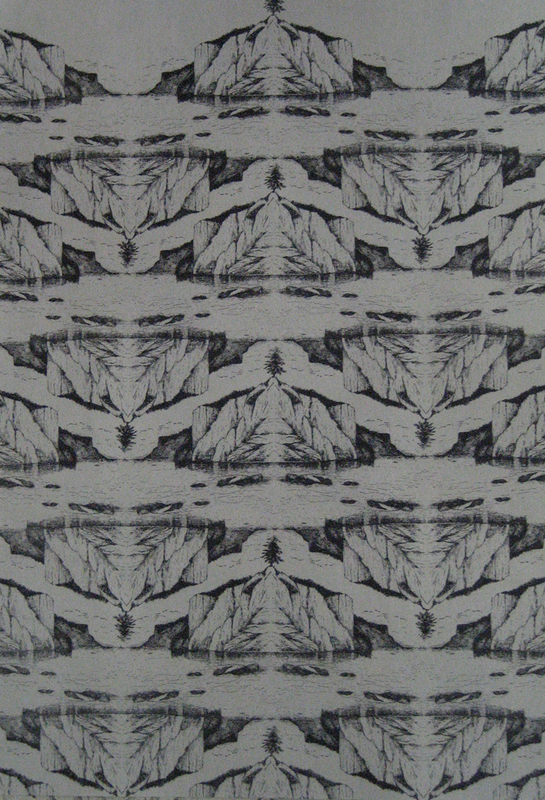 The concept of of creating a false landscape that would potentially wallpaper an interior space was interesting to me. I began to work with the printed image in Photoshop, combining it with a few other printed cuts to design my wallpaper pattern. Piles of cuts from the basement of Wells Book Arts Center. Some of my printed images that were used in the wallpaper pattern. On the surface of each piece of paper that I would edition the pattern one, I painted a combination of watercolor, animal skin glue and alum, and then printed the grain from a large piece of wood. I had to run several tests to make sure I had the correct exposure time and washout before I could make the final 23 x 10 plate. 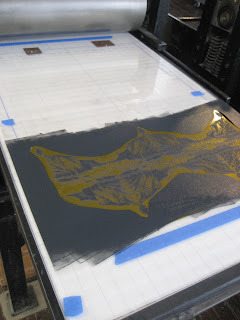 I did not have a platemaker, so I did the washout of the polymer plate by hand. Pin registration, stencil, and polymer plate used in printing the pattern. Close up of the pained paper, printed wood grain, and printed polymer. Final wallpaper print, 20 x 27, watercolor, woodblock, and polymer.